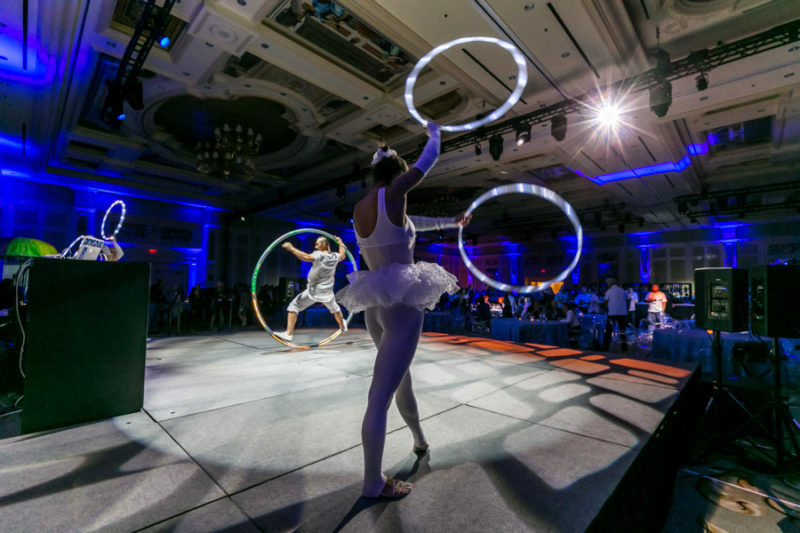 At On The Scene, we pride ourselves on creating unique event experiences attendees will never forget, and that’s exactly what we did for a recent pharmaceutical client. In June, OTS produced a welcome reception following the General Session of a Pharmaceutical Launch at the Sands Expo Center within the Venetian Hotel in Las Vegas. The OTS team decided to bring in the latest Virtual Reality equipment from across the country to meet the client’s vision. We decided on VR to offer an immersive and interactive experience that would keep guests entertained throughout the entire event. It was also sure to impress and have them talking about the event for weeks to come! Birdly Virtual Reality – These two VR stations took guests on an adventure of a lifetime as they flew like a bird and soared through the sky. Virtual Reality Pods – This VR simulator allowed guests to be completely immersed in a digital world complete with a wide selection of games and interactive experiences. Virtual Reality Slide – Guests sat on a slide like platform and were taken on a 360 VR ride as they simulated sliding down from one of the tallest buildings in the world at speeds of 100 miles per hour. Augmented Reality Rock Wall – Designed for two players, this interactive climbing wall took guests on an adventure like no other. Virtual Reality Skydiving – Guests got to experience what it would be like to go skydiving with this VR 360 motion. Their feet were even dangling and it felt as if they were really going skydiving! TS Immersitron – These interactive software tiles allowed guests to go on themed adventures and futuristic journeys as they could see their entire body within the virtual world. Virtual Reality Rafting – Guests experienced what it’s like to go on a rafting adventure through a river in this rafting motion simulator. In terms of color scheme and design, for the linens and furniture we used colors that were complementary to the existing decor of the ballroom, but still were able to create a serene environment per the client’s vision. We also were sure to focus soft seating around the VR stations to make them a focal point. We also wanted to add a modern feel to the regal and traditional atmosphere of the ballroom, so we brought in more modern furniture and of course, modern entertainment in the form of VR. VR wasn’t the only aspect OTS brought in for entertainment. We also had featured entertainers, including: contortion artist Floria Shapes, LED Cyr Wheel for fun environmental entertainment, and an oxygen bar to keep guests refreshed as they navigated the Entertainment Capital of the World! As a Las Vegas Destination Management Company, On The Scene has years of experience producing unforgettable corporate events in Las Vegas. If you’re planning an upcoming event and need an event partner to handle the coordination, decor, transportation, and overall event management, contact OTS today!